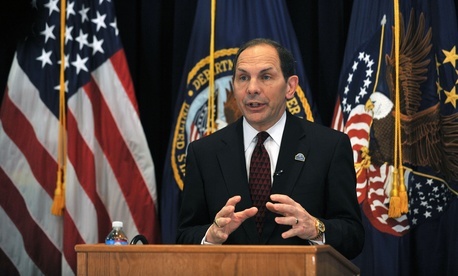 The honeymoon period for Veterans Affairs Secretary Robert McDonald is officially over. Barely three months after the former Procter & Gamble CEO was unanimously confirmed to run the embattled agency, he has come under fire for not moving fast enough to solve its myriad problems. Veteran advocates and lawmakers—particularly Republicans—say they are concerned about the VA's ability to implement a reform bill and discipline employees involved in a widespread data-manipulation scandal. McDonald has tried to quell those concerns, insisting he's following the new Veterans Access, Choice, and Accountability Act when it comes to getting rid of VA employees. The bill, passed in late July, gave the department more funding, decreased the time some employees have to appeal a disciplinary decision, and provided veterans with more access to non-VA health care. "If a member of Congress wants me to follow a different procedure, they need to pass a different law," said McDonald during an interview with CNN on Monday afternoon. His appearance was the latest stop in his media blitz ahead of Veterans Day on Tuesday. The VA says that it has proposed or carried out more than 40 disciplinary actions related to the data-manipulation scandal since early June. McDonald said that number could eventually swell to around 1,000, but it's unclear how many of those disciplinary actions would result in firings. And some lawmakers think McDonald needs to move faster to get rid of those responsible for the crisis. "I'm disappointed that instead of fully embracing the new firing authorities Congress and President Obama gave VA as part of the Veterans Access, Choice and Accountability Act, the department has shied away from them and even added more bureaucratic red tape, such as additional appeals and interminable stints on paid leave," said Republican Rep. Jeff Miller, chairman of the House Veterans' Affairs Committee, in a statement. "... Getting rid of failed executives should be the easiest part—not the most difficult." Miller has been at the forefront of a push to fire those responsible for manipulating data to hide delays in health care, but he isn't alone. Republican Sens. Richard Burr, John McCain, and Jeff Flake criticized McDonald late last month on the slow pace of firings. "These ongoing failures highlight the continued need for strong Congressional oversight of the VA to ensure that the dysfunctional culture and failures of leadership at the VA do not continue," the senators said in a statement. And concerns over the pace of disciplinary actions within the VA aren't going away. Members of the House Veterans' Affairs panel will dig into the topic Thursday, when Deputy Secretary Sloan Gibson will testify on the implementation of the VA reform bill. Veterans' advocacy groups are also raising concerns over McDonald's tenure. "We understand that there's a process that needs to take place, but when?" said Verna Jones, executive director of The American Legion, a veterans advocacy group. "... I think by putting a [deadline] on there, it gives the veterans and the veterans' community something to measure it by." Advocacy groups are also pointing out other delays in the implementation of the VA reform law—particularly the issuing of veteran Choice Cards, which give veterans more access to private health care. The first crop of cards went out out last week, with the rest expected to go out by January. They work like most other insurance cards, allowing a veteran to take a card to a group of VA-approved private health care providers in their area. Paul Rieckhoff, the founder of Iraq and Afghanistan Veterans of America, has offered support and help to McDonald since he became secretary. But he also had some tough words for the secretary when only some of the cards went out last week. "IAVA is disappointed by the department's failure to fully implement the Choice Card program by the law's deadline," he said in a statement. "... This is another fumbled opportunity to deliver for our nation's veterans or be fully transparent about an inability to do so." But criticism of McDonald isn't universal. Most Democrats have been noticeably silent, though even Obama said earlier this year that VA staffers who commit serious wrongdoings should be fired. Senate Veterans' Affairs Chairman Bernie Sanders, in a letter sent earlier this month, thanked the secretary for his "hard work." The Vermont independent also deflected some of the criticism over the firing process. While the department should act in a "timely manner," he said, it "is imperative that the VA get these personnel actions right—by building an effective case to do so." In many ways, McDonald is in a lose-lose situation. His comments that more VA employees could be disciplined brought a sharp rebuke from yet another advocacy group: the Senior Executives Association, which represents federal government employees. "We can only assume that it has stemmed from congressional pressure to publicly hold employees accountable for problems that have resulted largely from inadequate funding and the lapses of political leadership," SEA stated. "Mass disciplinary action will not serve the interests of veteran." This article appears in the November 11, 2014 edition of NJ Daily.